All of these represent a fresh approach with a strong nod to the past. Hagan notes "form, shape and material, and how these relate to one another, are the exxence of good design." It is a view that becomes quickly apparent in the way a richly finished coffee table anchors a room or the curves of a studded wing chair claim the space around it. "My work has never been about dictating one particular style. I'm open to nearly all periods," she states. 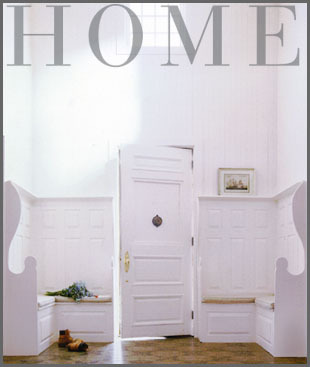 Victoria Hagan Home reflects that accessibility and was designed to work within the context of any well-designed interior. The collection is also centered on the belief that there is elegance to everyday living, and what the collection may do best is celebrate this happy paradox. "So much of today's lifestyle is about family, friends and gathering," observes the designer. "This collection is from the heart. It comes from my understanding of the home and what types of furniture work best with the kinds of lifestyles people tend to enjoy today. 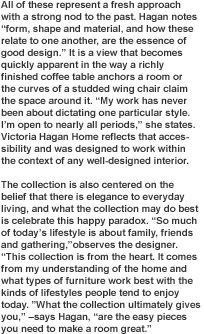 "What the collection ulitmately gives you," - says Hagan, "are the easy pieces you need to make a room great."